During his APEC address tonight, President Obama had some tough words for Republicans refusing to take in Syrian refugees. Yesterday he said that not taking in refugees would violate America’s values, but today he got much, much tougher in going after them. He said the “fear and panic” only serves to make the situation worse if everyone’s basing their judgments on “hysteria or an exaggeration of risks.” ..."I cannot think of a more potent recruitment tool for ISIL than some of the rhetoric that’s coming out of here during the course of this debate,” [he said]. Here we have the President of the United States demagoguing his domestic opponents, while abroad, in the wake of a devastating terrorist attack against the West. As virtually everyone has noticed by now, Obama reserves his most impassioned denunciations for his political foes; the massacre in Paris was a "setback," but damn these Republicans and their rhetoric. First of all, it's preposterous to suggest that a roiling debate at home over refugee vetting is ISIS' most potent recruiting tool -- but considering the source, it's not a surprising assessment. Barack Obama has been comprehensively wrong about ISIS at virtually every turn. He failed to anticipate their precipitous rise as a direct consequence of his reckless withdrawal from Iraq. He failed to recognize the threat they posed when he drew and abandoned his "red line" against Assad. As they gained force, recruits and territory, he sniffed that ISIS' potency was equivalent to that of a "javyee team," then tried to pretend he'd never said that. And hours before they pulled off a series of sophisticated, deadly assaults in a Western capital, he described their reach as "contained." His administration is now assuring us that the organization lacks the capacity to perpetrate an attack on US soil -- so sleep well, America. It's the allure of toxic Islamist theology, coupled with success, that has proven to be the terrorist army's strongest recruitment asset. 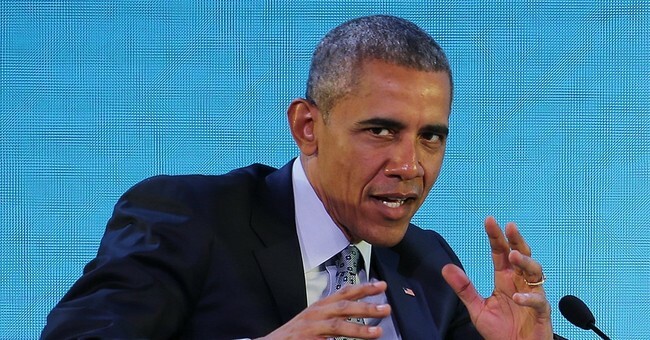 Second, Obama's framing of Republicans as terrorist recruiters is just the latest iteration of the facile narrative that any proposed course of action or commentary that deviates from the Left's prevailing pieties would result in giving the terrorists "exactly what they want," or something. The list of no-no's includes, but is not limited to: Raising concerns about admitting under-vetted refugees into the United States, tying the Islamic State's actions to Islam, detaining terrorists at Guantanamo Bay, and both bombing the terrorists and fighting them on the ground. Interestingly, one arrow in America's national defense quiver that is regularly exploited by terrorist groups to attract new members is our drone program, which President Obama has dramatically expanded. Should we stop raining hellfire on hardened jihadis in order to deprive them of a "recruitment tool"? Sure, we're liquidating terrorists, but isn't that exactly what they want? What utter, juvenile nonsense: "Shut up, you're helping the terrorists." End of discussion. By the way, ISIS has explicitly stated that they intend to infiltrate the West amid the mass refugee migration, a "huge concern" acknowledged by the US Director of National Intelligence, and they're actively following through on that approach.